The village of Lowpoint is located just east of Il. Route 89 on Woodford County Road #1950. This places Low Point approximately 20 miles northeast of Peoria in northern Woodford County. The GM & O Railroad runs through the east side of the village. The exact population of the town is not listed in the 2000 Illinois Census, however, by looking at a map of the town a guess would be a population of about 125 residents. 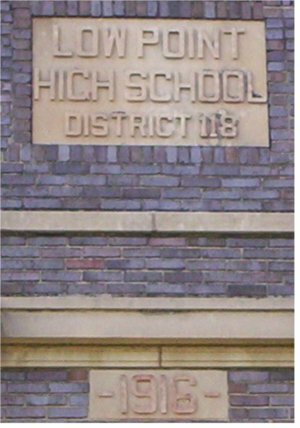 According to the Lowpoint-Washburn High School website, the school districts of Lowpoint and Washburn consolidated in 1952. The educational system in Lowpoint was started in 1874 with the building of the Lowpoint Academy building, Other pictures on this page depict the 1916 building that replaced the 1874 edition, and was added onto in 1935. The following history of the Lowpoint school system through 1928 was found on the website address: http://www.old-yearbooks.com/2y/il/lowpoint1928/index.htm. 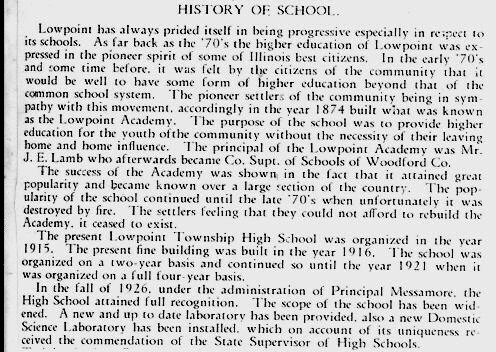 Read about the school history of Lowpoint according to the 1928 yearbook "The Quill" below. Remember, the "early 70's" the article refers to is the early 1870's! 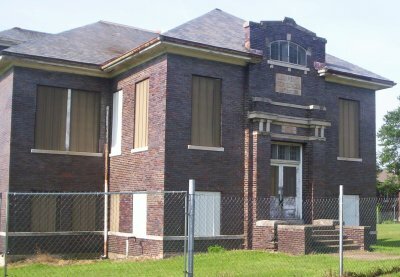 The 1916 building remains standing today, owned by someone who has put the school behind a fence topped with barbed wire. Several older vehicles are parked towards the rear of the building. "In 1952, the Lowpoint High School building was turned into the junior high building for 7th and 8th grades when Lowpoint and Washburn consolidated in that year. I attended 1st through 6th grade in the old Lowpoint Grade School, across the playground from the high school, and went to the old Lowpoint High School bldg for 7th and 8th grade. High school classes were all in Washburn from 1952 and on. 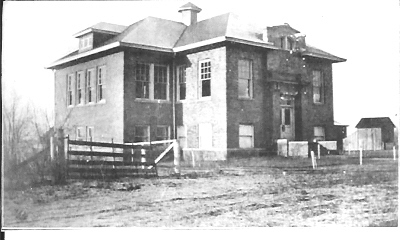 Classes were eventually conducted in the Lowpoint High school bldg. for 5th and 6th grades through the spring of 1976. The building was closed at the end of that school year, all students went to Washburn school buildings, and the building was eventually sold to an artist. The building still stands. To clarify, 1952 was the last year for Lowpoint High School to be used as a school building. 1953 was the first year of Lowpoint-Washburn High School. However the building in Lowpoint continued to be used as a community school through May, 1976." Name of 1928 yearbook: "The Quill"
Name of 1952 yearbook: "Cargo"
We could not locate any IHSA athletic records of Lowpoint on the IHSA web site. We are confident that Lowpoint High School offered basketball and track during its existence. Baseball was offered as well. If you can help us by providing information regarding Lowpoint High School and the town of Lowpoint please follow the directions below. The article below comes from the 1952 Lowpoint HS yearbook. The beginning of the article states that Lowpoint was a member of the Penta Conference along with Rutland, LaRose, Long Point, and Hennepin. The school's final year left the Lowpoint HS varsity with a 2 - 24 record. Good things were on the way however as the Freshman/Sophomore team won the conference title with a 7 - 1 record. 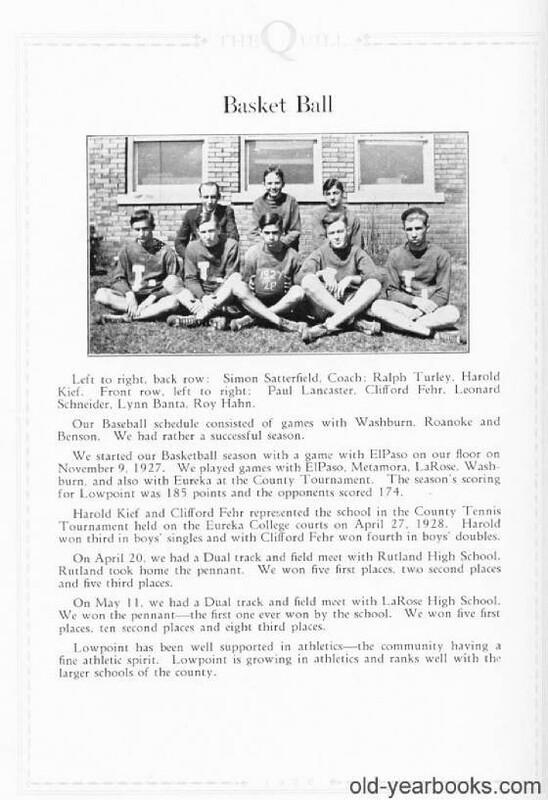 Check out this write up by the school's 1928 yearbook, "The Quill" found on the website www.old-yearbooks.com. Note the way "Basket Ball" is spelled and note also that tennis and track were offered to the boys. The Lowpoint HS boys competed in baseball in the Fall. 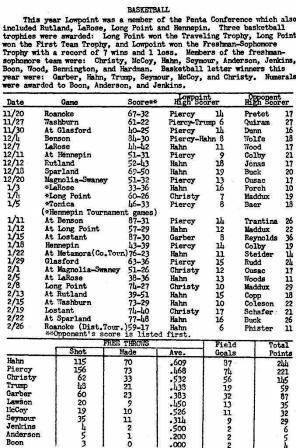 The varsity played six games in the Fall of 1951 while the Feshman/Sophomore team played in four games. The varsity's final team finished the season with a record of 3 - 3 while the F/S ended their season at 2 - 2. "I am from Minnesota and was traveling in southern Illinois last week doing some antique shopping with my wife when I found several Lowpoint H.S. yearbooks for sale by a dealer in an antique shop in Raymond, Illinois. Initially I did not purchase them, but being curious about where Lowpoint is in Illinois, I did a little Internet surfing from our hotel that night and discovered your wonderful website. One of my hobbies is researching old and current high schools in Minnesota, so your site naturally peaked my interest. For your awareness there are several other old yearbooks for sale at the same antique shop including a 1954 Washburn H.S. book after Lowpoint consolidated with Washburn. These are at the Lighthouse Antique Mall in Raymond. The yearbook name in 1951 and 1952 was "Cargo". 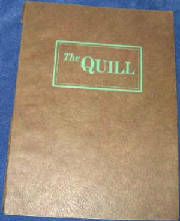 This must have changed sometime since 1928 when it was named"The Quill". Lowpoint nickname: Vikings (curiously, this was found only in the 1951 yearbook and not mentioned at all in the 1952 yearbook). 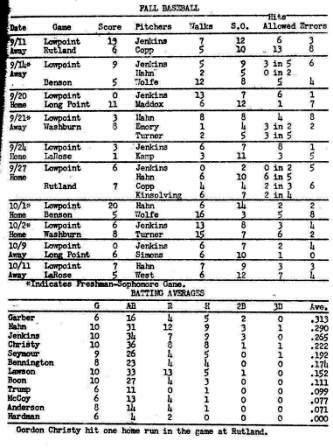 Lowpoint indeed had baseball and basketball teams. I'm attaching two pages in the 1952 yearbook, one for each sport, showing the scores and some statistics. The basketball page includes information about the athletic conference members. What was amazing to me is that in 1952 Lowpoint graduated only 4 seniors! As much as I hate to see small schools consolidate, I suppose this small class size was much of the reason. In 1951, Lowpoint had graduated 11 seniors. Unfortunately I could not scan any pictures of the students or of the school itself since they are "glossy" prints bound in the yearbook. Thanks for a great website. I sure wish we had a similar one here in Minnesota."